Welsh dual code rugby legend Garfield Owen has died aged 86 after suffering with Parkinson’s Disease since the 1990s. Wales rugby league heritage #246, his lone Welsh cap in the 13-man game came against France in 1959 where he kicked one goal in Wales’ 25-8 defeat. Born on 20 March 1932, Owen, who was educated at Cowbridge Grammar School, played rugby union for his home-town club, Llanharan, as well as Wrexham, Maesteg, Newport and Barbarians, and won six caps for Wales in the 15-man code. He joined Halifax in 1956, signing live on BBC TV’s “Sportsview”, and in six seasons with the Yorkshire club, he played 166 matches, scoring 535 goals and four tries, equalling 1,082 points. He then spent four seasons at Keighley, where he smashed goalscoring records, scoring three tries and kicking 348 goals, equalling 705 points in 127 appearances, and also became coach before retiring in 1965. He is one of the few Welshmen to have scored more than 1000-points in their rugby league career and is a member of the Hall of Fame at both Halifax and Keighley. Owen was talented in many sports other than rugby. He had been a international schoolboy cricketer, a record-breaking athlete with the javelin, a local golfing champion in Wales and for many years a crown-green bowler, being a member of Stafford Bowling Club, Halifax. Away from rugby, he was also a teacher but he later turned to selling cars. On retirement he and his family chose to stay in Halifax rather than return to Wales. 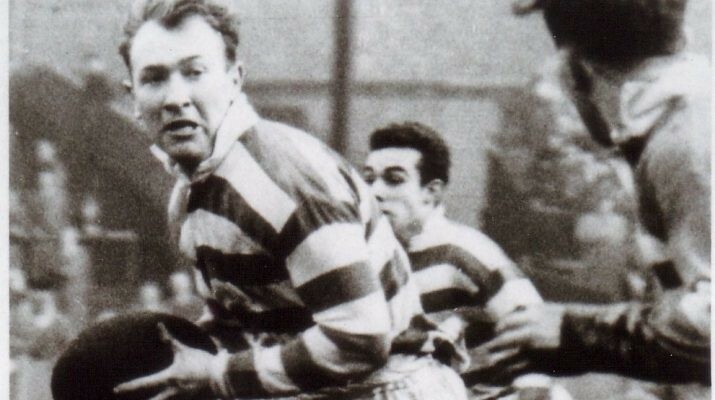 Wales Rugby League chairman Brian Juliff, himself a former Halifax player, said: “Garfield was an outstanding Welsh rugby ‘codebreaker’ and he will be greatly missed by so many people.